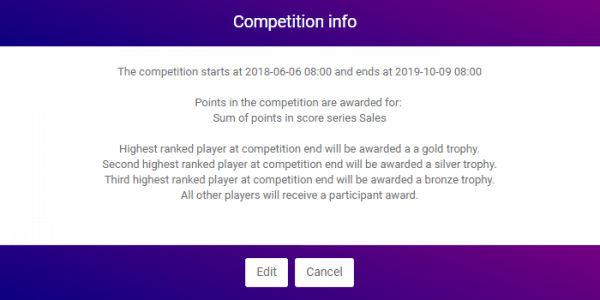 Now admins can add additional information to their competitions. 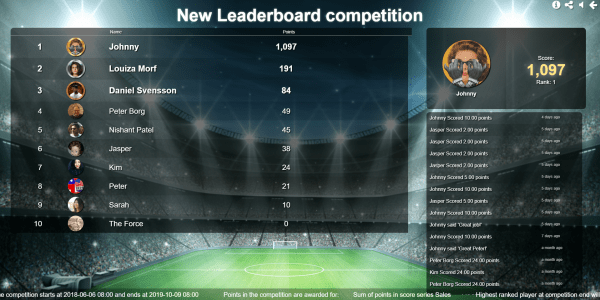 We have added an information button on the information box and on the competition view. The text in the view is editable by admins. Pointagram fills in default data such as winners and important dates. Press on Edit and change the text to fit your needs. Now you can add competition rules as a ticker on every competition. The ticker settings can be found under competitions settings and “customize theme”. You will find the ticker under the tab layouts. Here you can see the ticker implemented on a leaderboard dashboard. On the bottom of the dashboard you now can see a ticker with the information you want to display per competition.